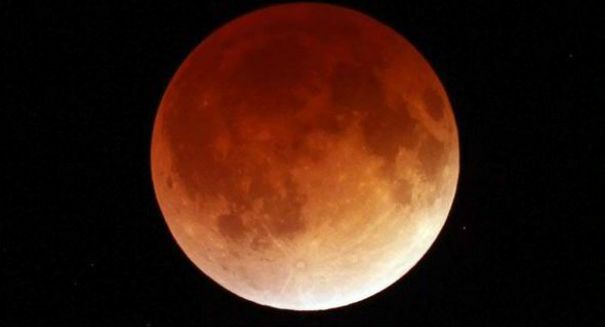 An extremely rare supermoon lunar eclipse wowed viewers despite a cloudy sky. That’s no space station. Special events collided and three celestial bodies lined up to put on an amazing view on Sunday September 27. As CNN reports, a lunar eclipse occurs when the sun and the Earth align to cast a shadow over the entire moon. While lunar eclipses aren’t extremely rare in astronomical terms, the one on Sunday was unique because it was the last in the series of four that has happened over the last two years. This phenomenon, called a tetrad, can take centuries to reoccur. The eclipse was also a special treat because it occurred during a supermoon. A supermoon happens when the moon is at its “perigee,” meaning the spot in its orbit when it comes closest to Earth. During this time, the moon appears at its largest and clearest. Having the eclipse coincide with a supermoon is even more rare: the last time the elements lined up, it was 1982. While many were worried that the skies were too overcast to allow for much of a view, many people still caught a glimpse. Pictures of the familiarly called “blood moon,” named for the red-orange color the moon turned while in the Earth’s shadow, flooded the Internet. NASA also streamed the event live for viewers living in areas with too much light pollution or the wrong angle to see it with their own eyes. The next supermoon lunar eclipse won’t occur until 2033.